It’s a new year. You are probably working on your resolutions. They could include eating better, working out more, being more organized or managing your time better. You have a to-do list that’s a mile long and there are some things on there you just don’t want to do. Small, little tasks that need to be done, but you don’t want to take the time or the energy to accomplish them. I’ve been there. Most of the smaller tasks weren’t difficult, but I still pushed those things to the bottom of the list until I was forced to do them. Then I learned the two minute rule. This rule was first introduced by time management consultant and author David Allen. It states if something takes less than two minutes, do it now. This is also helpful if you want to get in the habit of doing something. All it takes is a two minute start. This strategy can be put an end to procrastinating and help you successfully complete tasks. According to Allen, a lot of people procrastinate because they don’t want to take the next action to start a task or simply don’t know what their next action should be. Plan out in your mind how you are going to finish a task, breaking it up into small steps. Then if you can get even one step done in a short amount of time (two minutes) at least start it. Sometimes this is all it takes to keep going and complete it. Once I started using the two minute rule, I was surprised at how much I could accomplish in a short amount of time. For example, if I needed to send a quick email, put away clothes, or simply wash a dish I could get it done efficiently. In the long run, you’ll end up saving more time than you would by constantly putting off the task. The second part of the rule involves starting a new habit. This concept involves a bigger picture of beginning a goal. Any task or project can be started in two minutes. Allen based the rule off Isaac Newton’s theory objects at rest tend to stay at rest and objects in motion tend to stay in motion. When a person just starts a goal, no matter how big or small, they will continue to work on that goal. For example, if you need to write a report, just spend two minutes and write a few sentences to get started or if you need to read a book, read a little bit for two minutes. Before you know it you’ll have written a paragraph or read several chapters. Usually, when a person begins something, it’s easier to continue doing it. Another interesting part of the rule is it allows people to see the possibilities of what can happen when they start a project or task. Once started, people will tend to get excited to finish it or cross it off their to-do list. Getting started can be the most important part of a project. The focus is all about taking action. This rule can also be applied to exercising. Something we all love to hear, right? Recent studies have shown that short, intense bursts of exercise are as effective as longer workouts. They help improve a person’s health with little time commitment. 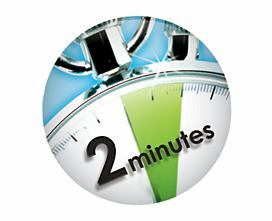 The purpose of the two minute rule is to improve productivity and get more things accomplished in a shorter amount of time. Some things might end up taking longer than two minutes to complete, but it will still be easier to do now than putting it off. Don’t you love the feeling of checking things off your to-do list and clearing the task from your mind? Start using this rule to decrease stress and have more time on your hands. The two minute rule may not work for everyone. But, it doesn’t hurt to give it a try. The next time you are working on that mile long to-do list, prioritize your tasks and see what you can get done in two minutes. Article originally published in Forsyth Woman Magazine. This entry was posted in Uncategorized and tagged effective, hallmark channel home and family, huffington post, time saving, today show, travel, two minute rule, washington post by METAYLOR. Bookmark the permalink.